For reasons never satisfactorily explained, Mai Zetterling wants to take a number of orphaned children from their home in Germany to a new life in South America. 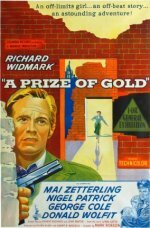 Her lover, an American soldier played by Richard Widmark, agrees to help her and decides to steal a load of gold bullion which is being flown from Berlin to London. A gang of dubious types is assembled and, predictably, the thieves fall out, one of them quite literally out of the airplane. It's part routine thriller, part soggy melodrama with a lot of winsome kiddies, and Richard Widmark plays a softie!